It is very easy to obtain a project and account on FutureGrid. While it is possible to just execute the three steps in our quickstart guide, we have provided a more in-depth description based on user feedback. You have certain responsibilities including managing project memberships and reporting results that must be conducted while you use FutureGrid, thus it is a good idea to read this section carefully. At the end of the section we also provide a mini-FAQ of information that may be of help with respest to issues you may have overlooked or that have not yet been answered. Some screencasts about this topic are available in section Screencast: Using FutureGrid. A portal account is necessary to communicate information about yourself to the FutureGrid team so that they can verify your identity and that you are a community member who has a need to use FutureGrid. Once you have a portal account approved you can apply for a project. A portal account will not give you access to the FutureGrid resources. You will have to go to the portal and join a project, or create a new one. At least one project you belong to must be valid. A valid project is one that is approved by a committee. If you are not in a valid, active project your access to FutureGrid will be blocked. Projects that do not report any progress will be blocked after a while. Note that you agree to update regular results via the portal as part of your agreement to use FutureGrid. The Project Lead submits a project and is responsible for updating the project page and project members. There is exactly one Project Lead. The Project Lead can assign editing and management roles to a Project Manager. He will have the same rights in regards to updating page content and members as the Project Lead. The Project Lead or Manager can add additional members to the project. A member must have a portal account. Sometimes project members leave a project before it is completed. Such members are no longer part of the project and should not have access to the project. However they can still be acknowledged to have played a role as part of the project by being placed as a member of the alumni role. As you are using remote compute resources, we will require that you are very familiar with ssh key management. You will need to upload a public ssh key to the portal so that we can create an account for you and use that public ssh key to allow you to log in to use the resources. Join a project or create a new project and wait for confirmation. Note that you must communicate with the project lead first before you can join a project. Please go to the XSEDE portal and apply for an XSEDE portal account. Create a new project as documented in the XSEDE portal allocations page or ask your XSEDE project lead to add you to the project. In order to utilize any FutureGrid resource, you must possess a FutureGrid portal account. Thus, apply for your portal account before you attempt anything else. This account is used to gather some information that we will use in the next steps. You must make sure that the information is complete before you proceed to the second step. FutureGrid performs basic verification of the information you provide when creating an account, so it may take a little while before your account is approved. Once you have a portal account, please proceed. Please note that you cannot access FutureGrid resources until you complete the next steps. It may take a day or two to get a portal account. Portal accounts will not be created over the weekend. On the portal’s main page at https://portal.futuregrid.org appears a Portal ‣ Register link. Following you will be able to Create a new account on the portal. Fill in ALL fields as much as you can. It is important that you specify your address information completely. If you are a graduate or undergraduate student please fill out your advisor’s contact information in the field specially dedicated for it. If he has a FutureGrid Portal name, please include his portal name if you know it. If you have an e-mail address from your institution, we ask that you use this address instead of one from gmail, hotmail, or other e-mail services that we cannot trace back to your name or institution. Usage of all non institutional addresses will prolong the application process. Please note that creating a portal account does not give you access to any FutureGrid resources. Please remember that checking your information will take time. Thus we recommend that you wait till you get a message that tells you that your portal account has been approved. Then continue to The next step. We are not conducting any portal approval outside of 10am-4pm EST. If there are no problems verifying your information your approval will take 1-2 days; if we have problems verifying your data or something else is not right your approval will be delayed. If you appear to be a spammer we will not notify you. If you are teaching a class, we have some special instructions for you in Section s-account-class. After your account has been approved, you can correct the information as part of the portal account User Profile Management. Check Identity Administrator checks the data submitted. Reject Rejected accounts will be deleted without notification. Wait for the e-mail that approves your portal account. If you have not heard from us within 2 buisiness days use the help form on the portal to contact us. 3a. Create Project Create a new Project. 3b. Join Project Join an existing Project. To apply for a new project, fill out the project creation form. Through this form we gather some important information about the project so that we can review it for approval. This information is used to report and document to us as well as to our sponsors, to state which activities are conducted on FutureGrid. The more precise you are in your descriptions and filling out the forms the better we can highlight your project. Once a project is approved, project members can join a project. This must be conducted by the project lead. It is mandatory for the project lead to agree to certain reporting requirements so as to provide information to FutureGrid. He will be responsible to make sure that they are completed and also implemented with the users joining the project. Thus the user is responsible to comply with the terms of the project in regards to reporting and acknowledgments in case of publications. Each project Project Lead has the responsibility to communicate such requirements to the members and managers. The project agreements override the individuals agreement. 3a.2. Project Approved The project has been approved. When applying for a project, you may directly visit the project creation page and fill it out. However, you may find it useful to prepare a separate (ASCII, or MS word) document and take advantage of spelling and grammar checkers. Furthermore, as filling out the form may take some time, it seems best to just copy and paste from your document into the form. This way you may avoid issues such as power failures or network interruptions which could cause you to lose the information that has been entered on the form but not yet submitted. although the contents presented in this material is available. programming assignments to be done early. through its github and community portal pages. single VM will typically be less than 5 minutes. 3b. Join Project? Join an existing Project. Get Permission Get permission from the project lead or manager to join the project. Delete Join Request Project leads will carefully evaluate if the person requesting to join is eligible. If not join requests will be deleted without notification requires to those that want to join. 3b.1. Join Approved The project lead has approved that you join the project. Go to the project page and press the join button/link. Project Active Checks if the project is active the project. 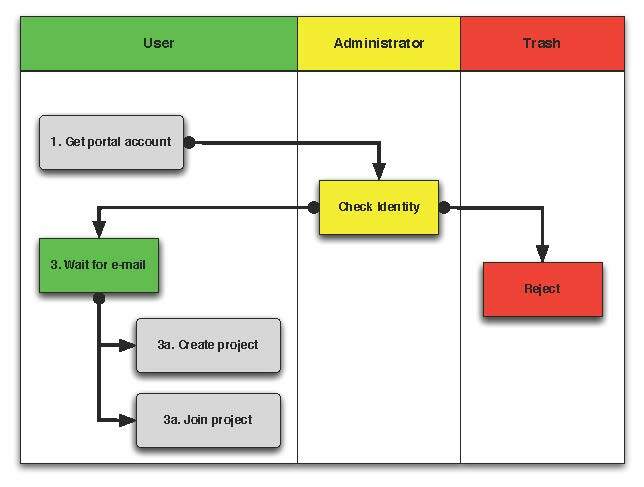 Deletion of a user can be a complex process if a user has used FG resources. However, the following is for most project leads sufficient: To remove a user from your project you simply can edit your project page and remove the user name from the list of members or alumni. If the user is in no other valid project she will no longer be able to use FG. If the user really needs to be removed from the system or from the portal, please fill out the help form with the username and the reason why he should be removed. Naturally, if you detect that a user is acting maliciously, please inform us immediately. We will disable access. Put in your subject line the prefix URGENT. Also upload references that you have produced for this project. You can upload when visiting your project and using the plus button in your projects. The reference will then be added and added for you to the portal. on the Portal. Once you visit one of them, you have the option to add results. Scroll down until you find the section “Project Results”. Please fill out this section and report upon the achievements of this project. Please also upload references that you have produced for this project. In each case, please make sure that you only upload/report references directly related to this project. After you have requested a project closing, our project committee will work with you to make sure we have sufficient results from you. Once a project is closed, all its members will be notified. 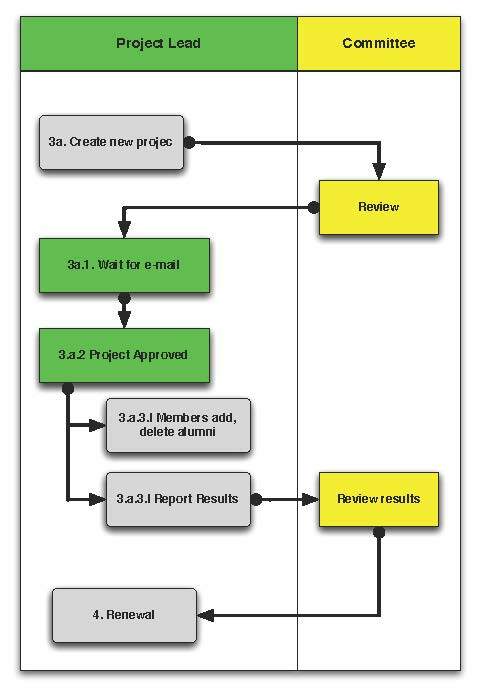 The committee might ask you for additional results even after the project is closed. In order to be able to log into the started VMs, among other purposes, you need to provide FG with a secure-shell (ssh) public key. If you are already a frequent user of ssh, and have a private and public key pair, it is perfectly reasonable to provide your public key. It’s public, after all. Copy your public identity into your system clipboard. Visit the ssh-key panel of your account. Click the link that says Add a public key. Changes to keys will take up to 1 hour to propagate through the system services. You are not allowed to use password less keys. Your account may be deactivated if you violate this policy. to add your favorite OpenID. For example, to add your Google OpenId you simply click on the Google icon. have uploaded a public key to the portal that you will use to log into some of its resources. Once these conditions are met, you will be able to access the resources and services that your project has requested and been authorized to use. See the section Services for a list of FutureGrid resources and services. This includes cloud and HPC resources. Accounts to these resources will be automatically generated once you have conducted the above steps. The turnaround time for you getting access to the system is typically between 30 minutes and one day. Create a portal account if you do not have one. Apply for an educational project, carefully filling out the form including how many students, broader impact, such as support of minorities, what will be learned, the course syllabus if available, a link to the course web page if available, the duration of the course including a time when the course is completed. We typically add a month so that incomplete projects can be completed easily. Make sure you enable the join button of the project, this will allow your students to join via a button click and you can easily approve or reject join requests. Come up with a “signup code” to be shared with the students. Give your students the signup code that you have chosen in the previous step. Communicate the signup code to the FutureGrid support team via a ticket submitted through https://portal.futuregrid.org/help. Make sure you specify your project number. Often it is also helpful to send a list of students to us so that, it is easier for us to assist them during the application process. Make sure your students sign up for a FutureGrid portal account and that they specify their profile information precisely. This information is used later on to grant students accounts on FutureGrid. Accounts will not automatically be created just because a user has a portal account. Have the students add you as their advisor in the advisor textarea. Remind the students to add their public ssh-keys to the portal. Some students may not have the knowledge what this means or what this is good for. We recommend that you in the first class teach the why they need to do this and how the can do this. In the portal users can add ssh keys when they go to the my portal section. It will take some time for the accounts to be created after an ssh key is uploaded, and the student is added to your approved projects. Communicate to the students to wait. We only approve accounts during business hours and it can take up to 24 business hours. Business hours are Mo-Fri 9am - 5pm EST. We will not answer any questions on the weekends. Once a student has an account on the portal, please make sure you add the student to your project. This is important as only people that are assigned to a valid FutureGrid project can have accounts on FutureGrid resources. Your project will by default have a project join request, which makes it easier for students to join your project. Provide the link to the students so that they can join. A convenient management button is provided where you can verify that the student is indeed a person that is to be part of your project. The join button can be disabled by you and you could instead add your students while entering their portal names. Hence, you will be able to manage the joining of students yourself. Be careful that you only join those students that are in your class. Please remember that a signup code is not really secret and that students may exchange the code with others. Thus it is a good idea to still verify if the user with the signup code is a member of your class. Also be reminded that some students forget to specify the signup code at time of their account creation. You have to deal with such forgetful students as a signup code cannot be added. If the student roster is changing, just edit the project details and add/remove them or move them to the alumni status. If student projects are due on Mondays remind them not to start their project on Sunday night incase they find out they do not have an account. Generally we recommend to make due dates of projects to be Thursdays till 5pm or Friday mornings. Be reminded that on the first Tuesday of each month all machines will be shut down and all unsaved running VMs or ongoing work may be lost. Please plan around this. Make sure you write a results section after your class is over. 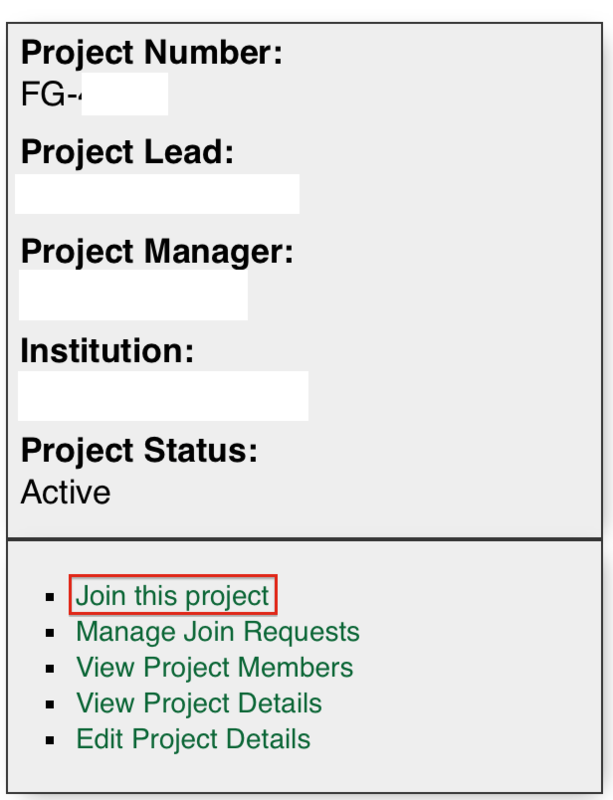 Go to your project, select the add member link and add the user portal names. Alternative have your users use the join button and you use the manage button. Why Do I See in the Project Table “Please Sign Up”? 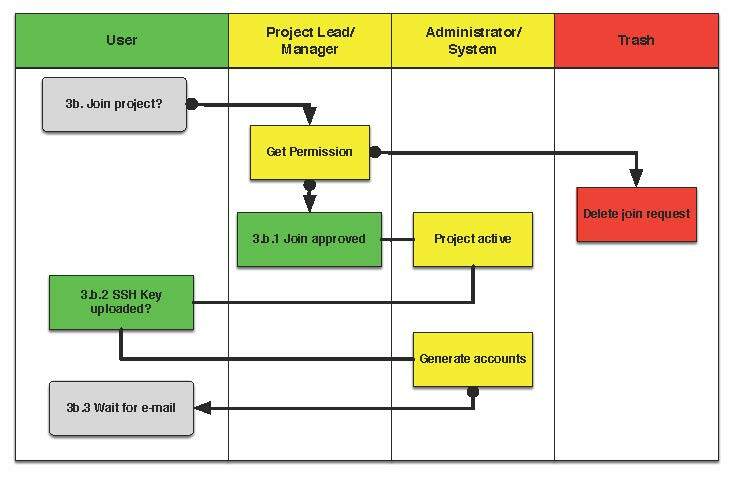 If you are the owner of a project and see this information under project lead or manager, you may not yet have signed up for a portal account. Please sign up for one, and we will change it in the project view for you. If you did everything and we can verify you exist two business days.